Barbarians are visceral warriors, reveling in the adrenaline produced by their violent displays of physical prowess. Often bathing themselves in the blood of their foes, either willfully or as a byproduct of their vicious strikes, a Barbarian whose mind is lost to the thrill of combat is truly a terrifying sight to behold. In this week's Theorycraft Thursday, Suckerfred1#1771 has invited us to take a look at his build, one that most effectively shreds your foes to pieces and makes a mess of Sanctuary's battlefields. As with all classes, a few builds are on the forefront of progression. Having grown bored with some of the more popular builds, Suckerfred1 set out to try something different with some of his existing gear. After acquiring the Bul Kathos's Oath weapon set, he saw the potential these powerful weapons could have and began his battle plan. It involved some spinning, some winning, and mostly evisceration (which doesn't rhyme but is still pretty badass). Because the proc on these Mighty Weapons generates a Physical damage effect, the rest of the build came together around that same element. The Whirlwind effect is strong on its own, and inherently Area of Effect oriented. As a result, you'll find Suckerfred1 has focused on bringing his foes in only to rip them to shreds and send their limbs every which way. Ready to get Physical (damage, that is)? This is a low Fury build, with no active spender. This might feel unintuitive at first, but give it some time! You may just find leaving a trail of spontaneous combustion behind you quite fulfilling. 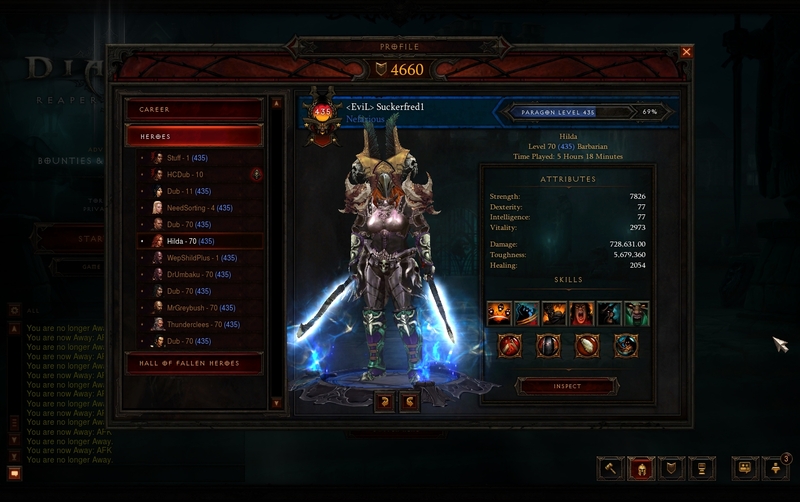 If your gear is sufficient enough to lose some Toughness, Suckerfred1 offers a couple minor tweaks based on your gear and gameplay needs. There aren't any items that are 100% mandatory for this build, though several are certainly the focus. Early Torment levels are certainly possible without the items listed below—but you'll be able to reach greater heights once you've acquired them! I was unable to capture Suckerfred1's full load out (as he's experimenting with other builds right now), but his stats show how far along his build was at the time of submission. Critical Hit Chance will be your primary bread and butter stat, combined with bonus Physical damage. You'll want as many Critical Hits as possible to take advantage of Cleave's knockback and the ensuing bonus damage from Strongarm Bracers. Don't forget to carefully balance your Toughness with your DPS stats, though many of the defensive skills offered above should allow you greater flexibility in building to your preferences. 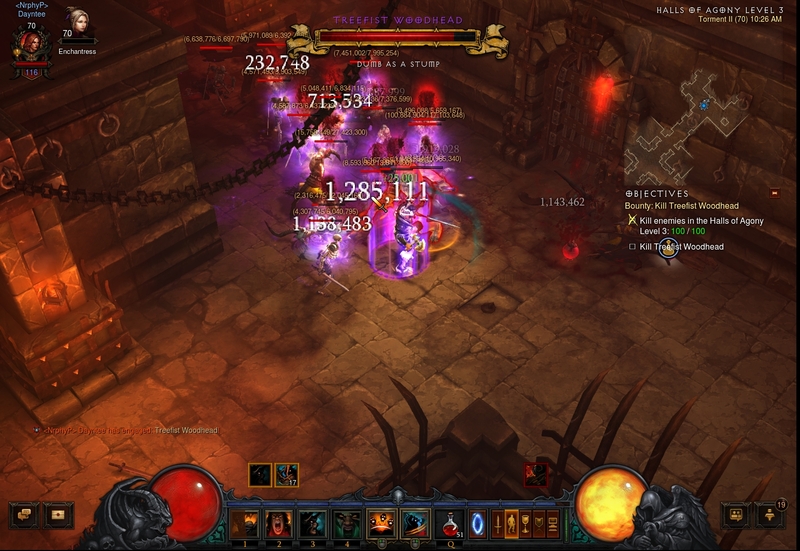 Suckerfred1 is a Normal mode player who is most comfortable running this build anywhere between Torment I to IV solo, with the potential of Torment V-VI with practice (and of course, appropriate gear). The Lead Foot Lacerator build might not be as efficient as your standard Leapquake build, but it does require a smaller number of Legendary items and is pretty strong on its own even without those recommended pieces. I've been experimenting with this build with relatively little appropriate gear (I have neither the weapons nor Strongarm Bracers), and was fairly comfortable in Torment II. Either veteran or new Barbarians should have no trouble giving this a try, regardless of their current gear. Those of you who have stuck with Theorycraft Thursday know that we tend to steer away from the standard popular build. There are a few reasons we take this approach. First, if you're interested in those builds, you likely either already know about them or someone has already laid out a guide more eloquently than we could provide here. Second, if we focused only on the top tier builds, we'd be providing information that's, at best, redundant and fairly limiting. Lastly, the focus of this running series is to give you alternative options and perhaps get you thinking a little more outside the box. I'm eagerly awaiting those beautiful blades - should jump me straight into Torment III! Suckerfred1 has embraced the goals of Theorycraft Thursday in his own way by building something outside the norm. His dedication to exploring both lesser-used items and skills definitely grabbed our attention, and experimentation with his build proved the Lead Foot Lacerator isn't just interesting mechanically, but also provides the visceral and satisfying results that are expected of the Barbarian. I really enjoy plowing through pack after pack and just watching them melt as Rend does its thing, and if that appeals to you, be sure to give it a try! How are your Barbarians faring, nephalem? Have you been using Rend? How about Bul Kathos's Oath? What would you change about this build to suit your needs? Meet me in the comments below and let me know! This wraps up the next section of Theorycraft Thursday. We'll be hosting our Round 2 votes next week, so be sure to visit us and cast your vote for your favorite featured build! And don't forget — if you're eager to submit your build for the next feature, there's no need to wait. Send your build to me at TheorycraftThursday@blizzard.com and perhaps we'll see you on our stream in the future!